Monasticism has existed from days of old, established by our Lord and God, Jesus Christ, Who said to the wealthy youth: "If thou wilt be perfect, go and sell that thou hast, and give to the poor, and thou shalt have treasure in heaven: and come and follow me (Matthew 19:21). Taking on the glorious angelic image, a person who is tonsured piously and solemnly rejects all passions of the flesh of this earthly life, and the fuss of worldly reason, vowing to actively strive towards God. But a monk, in the words of Blessed Augustine, willingly "dies, in order not to die," and in rejecting the world, he does not leave it. This is apparent in our own history, for in Russia , the focal point of public education and spiritual and cultural life was the monastery, offering "living water" (John 4:10). Monks laboring in monasteries painstakingly preserved science, literature, art, culture, and moreover, the Orthodox Christian faith, spirituality and morality, performing missionary and educational work. There are approximately 20 men ' s and women ' s monasteries in the Russian Orthodox Church Outside of Russia . One of them, called the "Lavra Abroad" and "our spiritual fortress" by Metropolitan Anastassy (Gribanovsky, +1965) of blessed memory, is Holy Trinity Monastery in Jordanville , NY . Who were the founders of this wondrous monastery of the Life-Giving Trinity and of St Job of Pochaev, the spiritual center of the Russian diaspora? This holy monastery was established in 1930 by Hieromonk Panteleimon (born Peter Adamovich Nizhnik) and his spiritual son, Psalm-reader Ivan Kolos, with the blessing of Archbishop Apollinarius of North America (+1933). The two sought monastic silence just as the brother-podvizhniki Stefan and Varfolomei "built a cell and little church" not far from Radonezh, the future Holy Trinity-St Sergius Lavra. Fr Panteleimon was born to a poor but large family on January 16, 1885 in the village of Rechitza, Grodenenskaya guberniya, Pruzhansky uezd, Gorodechnyansky volost'. When he turned 18, his parents wished to marry him off. "I did not want to marry at all," remembered Fr Panteleimon later, "and I asked my parents to let me go to America , promising to send them money from there." Peter knew that many of his friends did likewise: they would travel to the US , earn money, send it home to help their families and ensure their material well-being. "Many young people, my friends from school," recalled Fr Panteleimon, "would depart for America believers, but would then return a year or two later vehemently atheist. My parents, especially my mother, were simple people, illiterate, but they believed in God. My mother, seeing how living abroad changed young people, often cried inconsolably. I could not bear it and asked her: 'Mama, why are you crying like this?' She sobbed: "Son, don't lose God…' These words of my mother remained in my heart throughout the rest of my life." In 1913, the 18-year-old youth arrived in America . Peter's first trial was his job at a sugar factory near Chicago . Working on both holidays and Sundays, Peter began to wonder how "In America one cannot live properly, like a Christian, like we live at home, and I often prayed to God silently: 'Show me the way, O Lord, and I shall follow.'" But the Lord seemed to be testing the firmness of the young man in the Orthodox faith. For Peter, the indelible basis for his preservation of the faith of his Fatherland, far from home, were the tearful instructions of his pious mother: "Son, do not lose God." And the youth, unguided by anyone, left to his own care in the midst of the temptations all around him, remained staunch and unwavering to the legacy of his mother. A year passed. The First World War began. The enemy invaded his hometown. Many towns and villages, including Rechitza, were destroyed and burned to the ground, and his relatives "scattered throughout Russia ." The sad news during these war-torn years reached Peter from Russia . Military victories alternated with losses, until the horrible October revolution of 1917. Peter, now more than before, began to think about his future. He began to pray with renewed fervor, praying God to help and guide him. External temptations gripped Peter, but "the inner voice, the voice of his Guardian Angel," remembered Fr Panteleimon, "strengthened me against the devil's enticements, and helped me dispense with dreams of establishing myself in temporary worldly contentment." The year 1917 was a turning point in Peter's life. On April 18, 1918, the 23-year-old man entered St Tikhon Monastery, established in 1905 by Archbishop Tikhon of Aleut and North America , the future Patriarch of All Russia and Holy Confessor. In 1920, he assumes monkhood and is ordained a hierodeacon, and on April 10, 1921, he becomes a hieromonk. "In 1918, I entered St Tikhon Monastery in Pennsylvania and two years later became a monk and was first ordained a hierodeacon, then hieromonk. Over the course of ten years at St Tikhon Monastery, I saw that it was difficult to live a genuine monastic life as a young monk, and I began to think about where I could find a place where I could be a real monastic. Fr Joseph—at that time, Ivan Andreevich Kolos—helped me; at the time he was a choir director and psalm-reader at a parish. I met him at the monastery. He came to live with us and revealed to me that he is burdened by his service to the parish and wanted to become a monk. I also told him about my intentions. And so we decided to earn a little money to buy a plot of land. For this I began working at Sikorsky Airplane Factory in Stratford , CT , and Ivan Kolos stayed at his parish. In 1928, we bought a parcel of land, where our Holy Trinity Monastery is now. But I continued to work at the factory until we completely paid off the land. At this time, we were joined by another monk from St Tikhon Monastery, Fr Jacob. In the spring of 1930, after Pascha, I quit my job and moved to our property. Everything here was desolate, silence all around, and not a soul to be seen. I went up the wooded hill a few times, relished the quietude around me and gazed upon our property: an old, windowless, two-storey little house and a well, and four other wells in various spots—and that was it, forest and quiet all around; the wilderness. My first purchase, I remember, was a small metal teakettle. I would exit the house into the yard, I remember; I would ignite some logs between three stones and put the kettle with water on top, while I would go to Jordanville to buy food. I would return by the time the water began boiling, and breakfast was ready. The first brethren of the community were Monk Jacob, the old Deacon Ivan Morozov, Philipp Pisarik, Monk Philaret, and later two choir directors joined us: Peter Ivanovich Kozlov (later Hieromonk Paul) and Ivan Andreevich Kolos (later Archimandrite Joseph)" ( Pravoslavnaya Rus' [Orthodox Russia], September 1980). By the spring of 1935, after many tears and labors, a church was finally set up in the small monastic house and dedicated to the Live-Giving Trinity. On the day of the Holy Spirit that same year, we performed the consecration of the church and the entire monastery, led by Bishop Vitaly (Maximenko, +1960), the eminent Prior at one time of Pochaev Lavra. On this day, the brethren were tested by fire, when at the end of liturgy, smoke was noticed coming from the second floor of the monastic house, and in a few hours, everything burned to the ground "like a living sacrifice of Abel." "Upon the arrival of Archbishop Vitaly to America ," remembers Fr Panteleimon, "we appealed to him to head our monastic brotherhood. At first, of course, we followed the daily cycle of services, and in between saw to the management of the monastery. We bought a cow and two horses and began to work the land. We began to build a barn for hay and began a dairy. From our own timber we prepared the materials for a residential house for 16 cells and a house church. At this time, we were joined by a good carpenter, Hieromonk Ilya (Gavriliuk), and in 1935, the church was completed, which burned to the ground on the day of its consecration. This was God testing our faith. These were the first steps in the creation of our monastery, which, with God's help, is now growing and growing, and over this short period of time has become the Lavra of the Church Abroad. Thank God for everything!" And so, through the "trial by fire, the Lord cleansed this place for those who gather here, for those who are prepared for the complete denial of self, for prayerful labors, for heavy work and deprivation" ( Rossiya [Russia], No 233, 1935). The next day after service, performed at a location provided by local Americans, Psalm-reader Ivan Kolos (later archimandrite), was ordained to the monkhood by Bishop Vitaly and given the name of Joseph. The brethren, left under the open Jordanville sky, did not succumb to the despondency so alien to true Christian life, but relying on the unfailing help of God, undertook the reconstruction of the monastery, and by autumn of that same year, bought a two-storey house, much larger, more comfortable and of better quality than the first. By the mercy of God, in the mid-1940's the builders of Holy Trinity Monastery were able to repay the mortgage for the house, finish the barn for 80 horned cattle, expand the dairy, acquire another 200 acres of land, purchase all the needed farming equipment, buy a printing press and, soon a new linotype machine with Church Slavonic type and a large, 16-station press. Is all this not God's mercy, is there not the manifestation of the Lord's promise: "Ye shall receive by thy faith?" The builders/ podvizhniki [laborers in the faith] firmly believed in God's assistance and clearly sensed it in all their works and projects. There were instances remembered by Archimandrite Panteleimon and Archimandrite Joseph when in moments of dire need, and, it seemed, complete hopelessness, drawing hope and consolation through prayer that the Lord not abandon them and would soon help, "a letter would arrive by mail with an unexpected donation from a benefactor." In 1946, the monks of Holy Trinity Monastery began building a grand, golden-cupolaed stone cathedral, helped greatly by the generous donations of Professor Nikolai Nikolaevich Alexandrov, who joined the monks himself. "He was born on the shores of Azov Sea in 1873 to the family of a poor deacon, John Vasilievich Maximenko and Evfrosinia Feodorovna; the future Vladyka was the fourth of seven children. He was baptized with the name Vasily. His father died of pleurisy contracted while fishing, and his mother a year later from a broken heart. His 'orphan's wanderings' began when Vasya was only seven years old. "Suddenly, Vasily Ivanovich's path crossed with a young bishop (later Metropolitan) Anthony (Khrapovitsky, +1936), this veritable 'mountain of love.' Through his intercession, he shed his 'wolf's passport.' The young student was accepted to Kazan Theological Academy . There he underwent a 'monastic epiphany' and was tonsured a monk. He was then beset by tuberculosis, but Vladyka Anthony, while tonsuring him, gave him the name 'Vitaly,' which means 'full of life,' and said to him 'you shall live a long life!' Later, at St Alexander Missionary Academy, Fr Vitaly, already a hieromonk, taught theology: Liturgics, Pastoral Theology and Homiletics, and also Physics. Nearby was a hospital where the hieromonk visited those suffering from leprosy. In the seminary, Fr Vitaly once rescued a student who had spilled kerosene on himself and ignited like a torch. Suffering severe burns himself, Fr Vitaly smothered the flame; nonetheless, the poor seminarian soon died. "Was it for this reason that Fr Vitaly, during his consecration as bishop, likened his future service as a fight against fire? Speaking of ecclesiastical division, and of some letters written in the desire to overcome them, Archimandrite Vitaly said: 'What can be done in the face of such an elevated crisis? Turn away ? No ! When there is a fire, one does not ask: Am I able to put it out? While someone is drowning, does one think: Am I a good swimmer? No, one jumps in to save the victim…" (Archbishop Anthony of Western America and San Francisco: "Archbishop Vitaly of Eastern America and Jersey City" Pravoslavnaya Rus' , No 6, 1985). Metropolitan Anthony of blessed memory ascribed the blossoming of Pochaev Lavra in significant measure to the labors of Archimandrite Vitaly, who, in the words of the late Vladyka, "crucified himself for the people and for the Church." As soon as Vladyka Anthony arrived at the Volynia cathedra and grasped the state of affairs in Pochaev Lavra, he immediately offered to transfer Hieromonk Vitaly, who had spent three years as a teacher at Ardon Theological Seminary in the Caucasus , to Pochaev Lavra to organize a missionary and ecclesiastical press. Hieromonk Vitaly eagerly accepted his offer, and, by decree of the Holy Synod of November 29, 1902, he was released from his teaching position and appointed to serve under the Bishop of Volynia, with the elevation to the rank of archimandrite. By decision of the ruling bishop dated December 2, 1902, Fr Vitaly was appointed a teacher of the Law of God, head of the printing press and a member of the spiritual court of Pochaev Lavra. In 1903, Archimandrite Vitaly was appointed editor of the Lavra's Pochaevskii Listok [Pochaev Newsletter] and of the official section of the Volynskie eparkhial'niye vedomosti [Volynia Diocesan Bulletin], and from 1910, he edited the journal Russkiy inok [Russian Monk]. Upon embarking on his missionary activity, Archimandrite Vitaly organized a "Publishing Brotherhood," and expanded the Pochaev's publishing work. There were 360 persons at the Lavra, and the publishing concern, at its peak, employed 150 students and master printers. Archimandrite Vitaly led by strict ascetic example and tireless labor in his missionary and educational activity. In addition, Archimandrite Vitaly became the de facto head of the ecclesiastical-patriotic organization named Soyuz Russkogo Naroda [Union of Russian People], which played a benevolent role in the political, social and economic life of the Russian people in Volynia. It was mostly ecclesiastical figures who headed the sections of the Soyuz, which ensured the Church's influence on all aspects of the life of the locals. Thanks to various economic measures, the Russian people achieved independence from exploitation by the local administration which was especially harmful during this time. A network of peoples' cooperatives and reading rooms was established, thanks to which taverns emptied significantly and alcoholism levels abated. The peasants were provided with low-interest credit. A People's Bank was established in Pochaev by the Soyuz Russkogo Naroda , where the annual turnover of capital reached 2 million rubles a year by 1915. Nowhere in Russia was social assistance so firmly and benevolently established as in Volynia, and these efforts accorded with the local civil [ zemsky ] institutions. The election of candidates to the State Duma was only possible for candidates who received Archimandrite Vitaly's prior endorsement. Parish schools grew rapidly and two-grade public schools were built. Eager, enthusiastic youths were drawn to Church work during Pochaev's services and processions of the cross. Some of them assumed monasticism, others worked at the Publishing Brotherhood, while the older ones, bound by familial responsibilities, formed local cadres of supporters, joining the Soyuz Russkogo Naroda , which numbered one and a half million members. "He would counsel to worshipers tirelessly in the Lavra's churchyard," remembered Archbishop Anthony, "and as far as church-building was concerned, with the aim of preserving the remains of Bogdan Khmelnitsky's Cossacks massacred by the Poles (with whom the Cossacks often, and often victoriously, battled), which had been found in the local swamps, Archimandrite Vitaly erected a church, known as the 'Cossack Graves,' near Berestechka. This temple would become the large altar for an enormous, open-air church on feast days. As far as the press was concerned, where the Archimandrite both lived and worked endlessly, he was forced to evacuate it to Zdolbunovo during the second year of World War I, where it continued operations. Petliura looted it in Zdolbunovo, and what remained in Poland was seized by the Bolsheviks. "The Revolution profoundly stunned Fr Vitaly. He left for Mogilev , wishing to serve a liturgy in the presence of the Tsar, but he was not permitted entry. "In January 1918, during one of his trips, apparently, from Zdolbunovo to Kiev , he served in the ruined Great Lavra church, along with Holy Martyr Metropolitan Vladimir of Kiev. This was the final liturgy served by the martyr, performed only a few days before his martyrdom. "But then Archimandrite Vitaly was arrested, twice. The first time was when he was imprisoned along with Metropolitan Anthony (Khrapovitsky) of Kiev and Galicia and Archbishop Evlogy of Volynia in the Uniate monastery of Buchach. His second arrest was inside the walls of the church of the 'Cossack Graves.' They did not allow him to finish serving liturgy and led him to the brutal underwater casemate [dungeon] in Demblin. There he suffered interrogation and beatings. Fr Vitaly performed a liturgy there, using his own chest in place of an antimension. He partook of the Holy Gifts this way. Thank God, kind people interceded for him when he was in danger of execution. The accusations against him were absurd: he was accused of leading Ukrainian rebels. When he was finally freed, he served for a time in the diocese of Vladyka Vladimir of Belostok. "Concurrently with his publishing work, he performed his pastoral work in the Carpatho-Russian parishes that had returned to Orthodoxy from the 'Unia.' At first there were eight, then twenty-four such parishes. The Serbs had jurisdiction over these parishes, while the Russian Church Abroad had jurisdiction over the monastery and press. "Archimandrite Vitaly was strict with himself and his monks, more so than he would later be in America , when he was forced to pass on some of his duties. The archpastor had a special love for Vladimirovo and this period of his life. The periodical Pravoslavnaya Rus' , ecclesiastical calendars and church service books were all projects of his. An icon of St Job, shown working at the printing press among manuscripts and fonts, was sent as a blessing from Pochaev and is displayed in the print shop building. The brethren, beginning each day's work, approached this icon for his blessing before each day's work. "As Vladyka said, so he did. In 1934, for the sake of peace, the suspensions imposed by our archpastors on Metropolitan Platon and his vicars were removed posthumously. In 1935, the American Diocese, growing by now into a metropoliate, returned to the Russian Orthodox Church Outside of Russia, where it remained for 20 years, until the Cleveland Council" (Archbishop Anthony of Western America and San Francisco: "Archbishop Vitaly of Eastern America and Jersey City," Pravoslavnaya Rus' , No 6, 1985). The newly-consecrated Bishop Vitaly, departing for America in 1934, appointed Archimandrite Seraphim (Ivanov, +1987) as his successor. Archimandrite Seraphim, who later became Archbishop of Chicago and Detroit , was born August 1, 1897. His parents, Georgii and Vera, ensured that their son received a good education, and he finished Kursk Classic Gymnasium [high school] and then studied for a year at Moscow University . In 1916, he volunteered for the front and joined the 1st Siberian Corps. Later he took part in the Volunteer Army, first in Kornilov's Regiment, then in Markov's Artillery Brigade. After the evacuation, the future Vladyka Seraphim found himself in Belgrade , where he became interested in theology. He graduated with degrees in philosophy, and thereupon theology. In 1926, while visiting St Panteleimon's Skete in Mouth Athos, on the feast day of St Seraphim of Sarov, he was tonsured to the monkhood. That same year, the future Patriarch Varnava of Serbia (+1937), ordained him hierodeacon and soon hieromonk. In 1927, Hieromonk Seraphim was received into the Ladomirovo Brotherhood. Under the direction of Fr Seraphim, the brotherhood performed a great deal of missionary work, printing service books, religious literature, ecclesiastical calendars and other books, as well as Pravoslavnaya Rus [Orthodox Russia], edited by Archimandrite Seraphim. During World War II, Archimandrite Seraphim printed an enormous number of books. While collecting funds for this work, he traveled to Bulgaria . He hoped that with time he would be able to send service books and other religious literature to Russia . The brotherhood's work helped the development of church life under the difficult conditions of refugee life, for the newly-opened churches in refugee camps were all supplied by Ladomirovo's books. Evacuating the brotherhood of St Job of Pochaev from Ladomirovo in the Carpathians was a great task too; they first stopped in Germany , and after the war, they went to Switzerland . Here in early 1946, Fr Seraphim, on the basis of the ukase of the Synod of Bishops of the Russian Orthodox Church Outside of Russia, was consecrated bishop by His Eminence Metropolitan Anastassy and Archbishop Ieronim. That year, the monks, led by Bishop Seraphim, went to the USA , to Holy Trinity Monastery. By the unanimous decision of the unified brotherhood and by confirmation of Archbishop Vitaly, Bishop Seraphim was elected the abbot of Holy Trinity Monastery. He resumed the publication of Pravoslavnaya Rus and headed the monastery's print shop. Soon, Hieromonk Konstantin (Zaitsev, +1975) arrived as well and became the editor of Pravoslavnaya Rus , proving himself in this obedience as an "uncompromising zealot of ecclesiastical truth" ( Pravoslavnaya Rus , No. 22, 1954). In 1948, Archbishop Vitaly headed the monastery and Bishop Seraphim began preparing the headquarters for the Synod of Bishops in the US . Vladyka Seraphim persuaded Prince Belosselsky to grant the Russian Church Abroad a country estate in Mahopac and moved there, founding the Kursk-Root Hermitage, gathering a small monastic brotherhood there. By the time Metropolitan Anastassy arrived in the US , he already had a base to work from. That same year, in 1948, they consecrated the underground church of St Job of Pochaev, located under the cathedral, which was then still under construction. The public celebrated of the great consecration of the cathedral, performed on November 13/26, 1950, which was led by His Eminence Metropolitan Anastassy along with a host of bishops and clergymen with a huge gathering of worshipers from all over North America . During the minor entrance, the founder of the monastery, Hegumen Panteleimon, was elevated to rank of archimandrite. "Still," said Archbishop Vitaly, "that was not the last of God's mercies towards us. Having already seen the approach of the sunset of our lives here, we thought: what will happen to what we have built, this project we had devoted our lives to? Where will our successors come from in the harvest-fields of Christ?... And here a truly unbelievable thing happened: by Divine Providence, through the intercession of kind people, we now have operating the Holy Trinity Seminary for the preparation of candidates for monastic and parish clergymen... Upon us still lies the obligation to devote all our remaining powers to prepare the workers for the harvest of the Orthodox Church" ( Pravoslavnaya Rus , No 22, 1948). The Synod of Bishops of the Russian Orthodox Church Outside of Russia blessed the establishment of Holy Trinity Seminary, recognized by the State of New York as a higher educational institution. The Seminary Rector was Archbishop Vitaly himself, the Dean was NN Alexandrov. In 1952, His Eminence Archbishop Vitaly handed over his Rectorshop to Archimandrite Averky (Taushev, +1976), who had received the highest level of theological training in Bulgaria and adhering to a strictly Orthodox theological path. His Eminence Archbishop Averky was born Alexander Pavlovich Taushev on October 19, 1906, in the city of Kazan to a noble family of Simbirsk guberniya, Pavel Sergeevich Taushev and his wife Maria Vladimirovna. "The nature of my father's work," recalled Vladyka about his childhood, "forced us to constantly travel throughout Russia , and I thank God that although I was forced to leave my dearly beloved Homeland at an early age (in 1920), I was still able to see it and impressed it deeply into my young heart… My recollections of these travels in Russia seem to be like a dream now, but these memories will not leave me until my dying days… Unforgettable for me was the visit to holy Kremlin 'in the heart of Russia—the throne city of Moscow, with its holy sites, beginning with Uspensky Cathedral, where our Tsars were crowned and where the First-Hierarchs of the Russian Church were enthroned; Holy Trinity-St Sergius Lavra with the great relics of 'the griever of the Russian Land,' St Sergius; Kievo-Pechersky Lavra; St Alexander Nevsky Lavra; Petropavlovsky Cathedral; St Isaac's and Kazan Cathedrals and the church 'Savior-on-the-Blood,' in St Petersburg. I cannot believe that these are only 'museum' treasures now, that the former well-springs of the people's faith will not once again be reestablished there!" The favorite pastime of the young Alexander was reading spiritually-beneficial books kept in an enormous bookshelf in his father's den. From his early days he already had the subconscious desire to lead a monastic life, rejecting the temporal life, in which he saw nothing he wanted. In 1914, the First World War exploded, giving birth to a great burst of patriotism. The late Vladyka of blessed memory never forgot his impressions of the arrival in Lvov of Tsar-Martyr Nikolai Alexandrovich and the Tsarevich. "This was the only time in my life when I saw our Pious Emperor and His son, and actually, at a fairly close distance. What overall joy did the visit of the Tsar and his Son cause! What an unabating 'hurrah' thundered in the square where the soldiers stood at attention!" After many tribulations in Russia during the Revolution, the Taushev family fled Russia in 1920 and ended up in the large Bulgarian port city of Varna . A year before he graduated the Russian high school built here, Alexander met Archbishop Feofan of Poltava and Pereyaslavl, who came to Varna, which, remembers Vladyka Averky, led "finally to my decision for my future: firmly, without the slightest doubt or hesitation, I chose the monastic path." Finishing school with a gold medal, Alexander enrolled in the Department of Theology of the Sovereign University of Sofia. Successfully completing the courses, he received a Bachelors Degree with the highest honors. "What was I to do then? I could have taken some position in the Bulgarian Church , but I wished to become a monk and in particular to serve our Russian Church, to labor in her spiritual fields for our own Russian people. I regularly received issues of Pravoslavnaya Karpatskaya Rus [Orthodox Carpathian Russia], which gave me the urge to go to Sub-Carpathian Russia—at the time it was Czecho-Slovakia—where there was a mass movement to return to Orthodoxy among the Russian people enslaved and persecuted there at over hundreds of years, separated from Mother Russia and forced by their enemies into the Unia with Papal Rome. Vladyka Archbishop Feofan approved and blessed my intentions and gave me a sum of money for travel, since neither I nor my family had money to buy a train ticket. I received a document in response to my letter, signed by Ruling Bishop Iosif from Carpathian Russia , that I was accepted into the service of the Orthodox Diocese of Mukachevsko-Prjashev as assistant secretary of the Diocesan Administration in the city of Hust ." On May 19, 1931, Bishop Iosif of Bitol tonsured Alexander to the monkhood at St Nicholas Monastery in the town of Iza with the name Averky, in honor of St Averky of Jerapol, Equal-to-the-Apostles, and the following day, he was ordained a hierodeacon. In 1932, on the feast of the Transfiguration in Devichy Monastery in Dombok, near Cherlenev, in the Mukavich district, Bishop Damascene of Mukachev-Prjash ordained him hieromonk. In June of that year, Fr Averky was transferred to St Nicholas Monastery to minister to the parishes of Nankov and Boronjav, and in September, he was appointed Assistant Rector of a parish in Uzhgorod. Soon the rector of this parish departed for a better world, and Hieromonk Averky became Deputy Rector. By ukase of Bishop Damascene of August 7, 1935, Fr Averky was appointed Chief Editor of Pravoslavny Karpatorusskij Vestnik [Orthodox Carpatho-Russian Bulletin] and a year later, teacher of the Law of God in the Sovereign Real Gymanasium in the Russian and Czech Sovereign Civil and People's Schools of Uzhgorod. On Pascha of 1937, he was elevated to the rank of hegumen. In December 1938, he was appointed rector of a parish in Mukachev, the Administrator of a part of the Mukachevsko-Prjashev Diocese in Hungary and Head of the Bishop's Residence and Diocesan properties in Mukachev. In 1939, he was appointed Chief Editor of the Diocesan Administration. In 1940, Fr Averky was forced to leave Carpathian Russia and move to Belgrade, where he taught Pastoral Theology and Homiletics at the Missionary-Pastoral Department, reading a series of lectures on spiritual life at the Russian House, organizing religious education meetings with such topics as "Day of Russian Glory" in honor of St Vladimir, Equal-to-the-Apostles, anniversary gatherings for the 1600th year of the repose of St Nicholas, the 50th anniversary of the death of St Feofan the Recluse, etc. Here the future bishop participated in the services of Metropolitan Anastassy of blessed memory, First Hierarch of the Russian Orthodox Church Outside of Russia, and was the guardian of the Kursk-Root Icon of the Mother of God, Protectress of the Russian Diaspora, which performed numerous miracles and consoled Russian refugees in the difficult years of the Second World War. In 1945, Fr Averky arrived in Munich together with the Synod of Bishops of the Russian Orthodox Church Outside of Russia. Here he continued his missionary educational work, for six years teaching the seniors in two high schools: Merciful Samaritan in Munich and School of the Stateless in one of the refugee camps, and also taught in nursing classes at the Samaritan school. Fr Averky also conducted a lecture series at the Synodal House in Munich on the study of patristic writings and often spoke on theological, ecclesio-historical and theological-moral topics. In 1951, in connection with his appointment as President of the Missionary Education Committee of the Synod of Bishops, Fr Averky went to the USA and was assigned by Archbishop Vitaly to teaching at Holy Trinity Seminary in Jordanville. "Then, during our first years in America," remembered Vladyka, "overall enthusiasm ran high: church life was our key then, new parishes were springing up, churches were being built, religious and church charity organizations were being formed, for example, the St Vladimir Youth Circles, the Fund of Fr John of Kronstadt (before his canonization); often, here and there, we had conferences and church celebrations, attended by great multitudes, and one sensed a religious renewal in the masses of believers, finding a calm, peaceful and more or less secure existence here, and churches were very zealously attended." Fr Averky, as an archimandrite and then a bishop, expended a great deal of energy as the spiritual leader of the St Vladimir Youth movement, created with the aim of "helping our Russian youth develop a correct Orthodox and Russian-nationalist worldview, so that it would become the guiding principle in their lives." On the day of the Holy Spirit in 1953, he was consecrated bishop at Holy Trinity Monastery Cathedral. On May 12, 1960, after the fortieth day of the repose of their Abbot, Archbishop Vitaly, at a general monastery assembly, held with the blessing of Metropolitan Anastassy, Bishop Averky was elected and confirmed as the Abbot of Holy Trinity Monastery. This heavy burden was borne by Vladyka until his very death in April 1976. In 1974, Vladyka Averky and the monastic brethren hosted the III All-Diaspora Council at their monastery. As well as many brochures on theological, ecclesio-historical and religious-moral topics. In 1976, Bishop Laurus of Manhattan became the abbot; now he is the First Hierarch of the Russian Orthodox Church Outside of Russia, a novice and brother of the monastery for many years and a zealous adherer to the legacy of Vladyka Vitaly (Maximenko). On Sunday, June 27, the residents of Holy Trinity Monastery in Jordanville marked the 50th anniversary of the pastoral service of His Eminence Metropolitan Laurus, whom Hieromonk Roman (Krassovsky) congratulated warmly before the veneration of the cross. On this blessed anniversary, His Eminence Archbishop Kyrill of San Francisco and Western America, on behalf of the bishops and brethren clergy serving at the cathedral of San Francisco on the feast day of St. John read a congratulatory address to His Eminence Vladyka, wishing him Divine assistance in his difficult task of serving the Russian Church . The sheer volume of cares and burdens of our First Hierarch is difficult to grasp: he is First Hierarch of the Russian Orthodox Church Outside of Russia, President of the Sobor [Council] of Bishops and of the Synod of Bishops, Superior of the most renowned monastic community in the Russian Diaspora, Holy Trinity Monastery in Jordanville, and the Rector of its Seminary, Editor-in-Chief of the chief publication of church society, Pravoslavnaya Rus' , and bears many other responsibilities not directly connected with his duties, down to the task of daily needs of managing the monastery. Vladyka joins the monastic brethren every day at midnight office and Divine Liturgy. Taking into account the less-than-robust health of Vladyka, even a tenth of his responsibilities would seem more than enough to bear. But he does not complain. Quietly and humbly he fulfills his obediences and patiently endures all sorrows. Yet Vladyka is not roped off from the wide array of visitors, not by a doorman, not by an aloof secretary. You can enter his office at any time, no one will subject you to suspicious interrogation: Why, what for, on what matter, but Vladyka cannot see you now, he is busy, etc… He can be stopped on the way from church to discuss a serious matter, he will not wave you off with excuses that he is too busy… No squadron of subdeacons guards him (except during services), escorting him to the door of his cell, keeping admirers and beseechers at bay. He opens his own doors, puts on his own rassa, checks the church calendar on his computer himself and does most things himself. No one prepares special dishes for him; he eats the same food as the lowest novice together with the monastic brethren. The accessibility and unpretentiousness of Vladyka are rare. Seminary graduates of the class of 1967, the year Archimandrite Laurus was consecrated bishop and appointed to Manhattan , opened the commemorative booklet with the following words: "Everyone meets in his lifetime an individual who leaves a lasting impression. Such people are not forgotten, just as one does not forget one's mother or father. Just such a remarkable person for us, the Class of '67 of Holy Trinity Seminary in Jordanville was then-Archimandrite Laurus, the Seminary Dean." Interesting and educational is how the late Archbishop Seraphim (Ivanov, +1987) of Chicago and Detroit called Vladyka Laurus' life in his notes on his consecration. The baptism of the young Vasily was performed by the Head of the Orthodox Mission in Slovakia , Archimandrite Vitaly (Maximenko), later the renowned bishop of the Russian Orthodox Church Outside of Russia (previously Archimandrite of Pochaev Lavra and the re-founder of the church publishing house). The Monastery of St. Job of Pochaev in Ladomirovo was founded by Vladyka Vitaly. The childhood of the future First Hierarch was spent in this monastery, under the spiritual guidance of Vladyka Vitaly, of which he would later say: "From my childhood, the Lord led me to the Monastery of St. Job of Pochaev in the Carpathians. There, in the monastery, I received my initial spiritual education." Vladyka Vitaly was not only the Superior of the monastery, but the founder of the brotherhood of St. Job of Pochaev. It is no coincidence that at the Jordanville monastery—in some sense an heir to Ladomirovo—the name of the publishing concern also bears the name of the laborer-in-the-Lord of Pochaev. An icon of the saint with his relics is found here. It was brought out by Archimandrite Vitaly from Pochaev Lavra, and spent 20 years at the Ladomirovo monastery, accompanying the brethren later to the USA . "Vasya grew up before my very eyes. First I saw him as a child, then a crumb of a boy. At age 5 or 6 he began to serve as an acolyte at our church during holidays. I remember him as a boy of 8 or 9, coming to me as the monastic superior after the departure of Archbishop Vitaly to America , and asked me to accept him as a monk. I smiled, patted him on the head and said that it was good that he wanted to devote his life to God at such an early age, but that he needed the consent of his father." The next Sunday, Vasya came with his father, who quite eagerly agreed to allow his son to be raised in the monastery, especially since he was poor, a widower, and had three other children. At the age of 12, Vasily first met the First Hierarch of the Russian Orthodox Church Outside of Russia, Metropolitan Anastassy (Gribanovsky, +1965) of blessed memory. The spiritual father of young Vasily, Fr. Kyprian, led him up to ask the blessing of Vladyka Anastassy, who then prophesized: "God bless you, you will be a pastor." During World War II, in the summer of 1944, the Red Army was approaching the Carpathian Mountains . The journal Pravoslavnaya Rus' , published by the Monastery of St. Job of Pochaev, never hid its negative attitude towards communism. It was not difficult to guess the fate of the monastic brethren should the Soviets seize the monastery, and so the majority of monks chose to leave for the West. It was especially difficult for the local natives to take this big step, including the young novice Vasily. First he remained behind with a few monks. Most of the monastics were already in Bratislava , the capital of Slovakia . At this time, Archbishop Seraphim was able to reach his native monastery and persuade Vasya, and another young man named Vasya, now Archimandrite Florus of Holy Trinity Monastery in Jordanville, to join those who were fleeing. Returning to Bratislava , Vladyka Seraphim sent Hieromonk Vitaly, later the First Hierarch of the Russian Orthodox Church Outside of Russia, to fetch them, and, with the permission of their parents, brought both to Bratislava . Through Germany and Switzerland , where the future Vladyka Laurus donned the cassock, became a novice and, for a time, was an altar boy with Metropolitan Anastassy of blessed memory, he arrived safely in Holy Trinity Monastery in Jordanville , USA , in 1946. The complicated and difficult path of the young man could not but affect his spiritual condition. During such times, Vasily had two reliable spiritual guides: Archimandrite Kyprian (Pyzhov) and Archbishop Vitaly (Maximenko). Vladyka Vitaly gave him a gift of his portrait with a similar prophetic inscription: "To my spiritual son from the baptismal font and throughout my service to the Orthodox Church and the Russian people" 20 December 1946… These words, as Vladyka Laurus later would say, "strengthened me spiritually." Vladyka Vitaly, in his will, left Vladyka Laurus a valuable and memorable pectoral cross, which he had received from the Union of Russian People. Vladyka Vitaly spoke of its value and significance once: "Of all the ecclesiastical items I owned during my service to the church, the thing most dear to me was the pectoral cross given to me, when I was an archimandrite, from the Volhynia Union of Russian People. I especially treasure it…"
On June 2, 1958, Fr. Laurus was awarded the gold pectoral cross, and on September 6 of the following year, elevated to the rank of hegumen, and awarded a palitsa. By decision of Metropolitan Anastassy of blessed memory, in 1960 he was appointed Dean of the Seminary. At the same time, over the course of several years, he fulfilled the obedience of Secretary of the Monastic Council and the supervisor of the book warehouse and monastery's travel secretary. On November 21, 1963, he was awarded the cross with ornamentation, and on April 17, 1966 elevated to the rank of archimandrite. That same year, Fr. Laurus made a trip to San Francisco , where he participated in the funeral and burial of St. John (Maximovich, +1966). "Archpastors of divine wisdom, pray that the Lord helps me be a strong, incorruptible keeper of the life-bearing laws and traditions of the Orthodox Church, not only in word, but more importantly, in deed. I pray that you do not cease strengthening me, who is inexperienced, with your directions." And also: "In laying your episcopal hands upon me, a sinner, to invoke upon my head the flame-like grace of the Spirit, pray, God's bishops, that upon me will come ‘Divine grace, ever healing the ailing and fulfilling the needy,' and would help me 'rightly administer the word of Thy truth.'" "We bishops, who lay our hands upon you in the holy sacrament of the Consecration, rejoice now with you, and now with love we accept you into our archpastoral family, the clergy rejoices, prayerfully participating in the mystery of Consecration; the multitude of your followers and spiritual children rejoices, the flock rejoices—the flock that is now both mine and yours… But I think, more than anyone, Archbishop Aveky and the brethren of Holy Trinity Monastery rejoice." Despite his duties at the Synod of Bishops, Vladyka's ties to the seminary and monastery were not broken. He drove to Jordanville every week, reading lectures as before, and during the illness of Archbishop Averky of blessed memory, managed the monastery administration. "It would be difficult to enumerate all those instances of consolation which, during the short period of his service in the rank of bishop, His Grace Bishop Laurus generously, without thinking, distributed among the members of his flock. These consolations were great and small: in the resolution of important matters of church life and personal issues, in advice and guidance, and daily friendly conversation. Vladyka's mere presence was often a consolation. His steady, humble character brought peace and quiet joy to even the most troubled souls." The love and gratitude of his flock followed Vladyka Laurus everywhere he performed his often difficult duties. For instance, during his 10-year sojourn in New York as the Secretary of the Synod of Bishops and Bishop of Manhattan, Vladyka Laurus earned grateful acknowledgment; even now one can find elderly parishioners who remember the days when he was the "master of the house." The devotion on the part of the worshipers of the Synodal Cathedral, and of the faithful of New York City in general, was expressed also in how the news of his transfer to Holy Trinity Monastery spread like wildfire in the city; in a brief time some 1000 signatures were collected on an appeal to leave him on the Manhattan cathedra. The appeal addressed to Metropolitan Philaret said: "This unexpected news struck us with sorrow, and we appeal to Your Eminence with this urgent request: do not take away our Bishop from us." Who has not heard of the pilgrimages to the Holy Land , which he often organized in years past, giving new life abroad to that old, pious Russian tradition? And not only was it pilgrimages that Vladyka led, he also helped the convents there through his fatherly care. What consolation to our monastics in the Holy Land it was when Vladyka Laurus came to visit! How much spiritual guidance and advice he gave to his spiritual children in our monasteries in the Holy Land ! After the death of Vladyka Averky, the monastic brethren unanimously elected Vladyka Laurus as their superior. It was not easy for the clergy and parishioners of the Synodal Cathedral to part with their respected and beloved bishop. But Holy Trinity Monastery cannot be imagined either. When a serious illness struck him in the 1990's, prayers were said for him not only in the monastery but throughout the Russian Diaspora. Innumerable get-well cards were sent from all corners of the world. The first, largest bell, is 83 inches in diameter, made in memory of the 1000-th Anniversary of the Baptism of Russia and her Illuminator, Holy Prince Vladimir, Equal-to-the-Apostles, and St Olga; a gift of the Russian Diaspora as a whole and of the AA Joukowky-Volynsky family and the Kuban Cossacks. The second, in memory of St Patriarch Tikhon and Metropolitan Vladimir of Kiev, Metropolitan Veniamin of Petrograd, Metropolitan Peter of Krutitsa and all the clerical Martyrs and Confessors of Russia. A gift of the Pawuk family. The third, in dedicated to the Royal Passion-bearers and all those who suffered torture and death under the atheist regime. A gift of Vladislav and Marina Casard . The fourth, in memory of the First Hierarchs of the Russian Orthodox Church Outside of Russia. A gift of the Mukhin family. The fifth is a gift of Holy Trinity Monastery in memory of their reposed founders and brethren and all Russian monastics. The sixth, from the parishioners and sisterhood of Epiphany Church in Boston in memory of Russian bell-ringers. The seventh, a gift of the brethren of Holy Elias Skete on Mount Athos in memory of the Russian monks of the Holy Mountain. The eighth is a gift of the Schneider family. The ninth bell is a gift from V. and T. Pokhounov. The tenth is from the I. Vertogradov family. The eleventh is in memory of the late brethren of Pskovo-Pechersky Monastery form I. Pram. The twelfth is a gift from L.T. Miroshnikova. The thirteenth is a gift of A. and M. Perekrestov. The fourteenth is a gift of Ya. Vainer . The fifteenth is a gift of S.K. Frolov, donated in 1977. Besides the consecration of the bell tower, the regular Conference of Russian Orthodox Youth was held. The topic of the Conference was "Millennium of Orthodoxy in Russia —Summation and Perspectives." At the same time, an exhibition of the works of Archimandrite Kyprian (Pyzhov) was held, organized by M.E. Lochmatov. The show was held in the Seminary building, where the Monastery Museum is located. The celebrations culminated with a sermon by Vladyka Laurus at the banquet: "May this bell tower and its bells be a memorial to the fact that Russian people, scattered in foreign lands, prayerfully marked the 1000 th Anniversary of the Baptism of Russia." In the early 1990's, Vladyka Laurus performed the consecration of the new chapel dedicated to the Optina Elders, located on the third floor of the monastic building. During winter, compline is performed here, where a multitude of the relics of saints and other holy items. In July 2001, the Synod of Bishops appointed him Deputy of the retired First Hierarch of the Russian Orthodox Church Outside of Russia. In accordance with the decision of the Sobor of Bishops of 2001, Archbishop Laurus of Syracuse and Holy Trinity was selected First Hierarch of the Russian Orthodox Church Outside of Russia. The celebration of the enthronement of His Eminence Vladyka as metropolitan was scheduled for Sunday, 15/28 October. On the preceding Saturday night, all-night vigil was served with an enormous gathering of clergymen and worshipers at the Synodal Cathedral, from near and far. The polyeleos was particularly magnificent that day. While the Synodal Choir sang ТPraise the Name of the Lord,У by A. Kastalsky, the new First Hierarch emerged from the altar: Metropolitan Laurus. His full vestments were adorned by the panagia of the first First Hierarch of the Russian Orthodox Church Outside of Russia, Metropolitan Anthony (Khrapovitsky, +1936), which was later worn by St. John (Maximovich), then by Archbishop Anthony (Medvedev, +2000) of San Francisco and Western America, the spiritual friend of Vladyka, who loved and cherished him for his staidness, his devotion to the Church and for his judgment, who participated in his consecration in 1967; also worn was the cross of Metropolitan Anastassy (Gribanovsky), which was kept after him by Vladyka's spiritual father, Archimandrite Kyprian (Pyzhov). At the end of vigil, at the end of the first hour, His Eminence Archbishop Alypy of Chicago and Detroit and His Eminence Archbishop Mark of Berlin and Germany imparted to him the symbols of a metropolitan's rank with the words "Axios": the blue mantle and white klobuk, which were first blessed with holy water in the altar. Humbly accepting these items, Metropolitan Laurus said: "I ask the holy prayers of the bishops, clergy, our beloved flock, for the Lord to strengthen me in bearing this obedience of responsibility, which the Sobor of our Church Abroad has laid upon me. Remember me in your holy prayers." "In these days, when our Sobor of Bishops is convening and my election took place, I remember the words of the Lord spoken to His disciple Peter, after His sufferings and resurrection, when he appeared to the apostles and asked Peter: 'Peter, do you love me?' And then the Savior said 'When thou wast young, thou girdedst thyself, and walkedst whither thou wouldest: but when thou shalt be old, thou shalt stretch forth thy hands, and another shall gird thee, and carry thee whither thou wouldest not.' And so now what I would not do, that has come upon me. Here, in my old age, my brother archpastors have girded me and given me the ship of our Russian Church Abroad. I have taken this, as I told the archpastors, as an obedience to God, to the Church of Christ and our Sobor of Bishops. I do not sense that I have any advantages, nor any strength to steer this ship. I rely solely on the help of God, on the prayers of our archpastors, the prayers of our flock. And only with your help, dear fathers, brothers and sisters. If we can do anything, then it is only through common prayer, through common effort. May the Lord strengthen us in unity of mind, unity of spirit and conciliarity, the conciliarity of which Bishop Alexander spoke today. For it is necessary for Russian Orthodox people, and for Orthodox Christians in general to be one in spirit and action. I ask holy prayers of all of you." The concluding words at the trapeza were spoken by His Eminence Metropolitan Laurus himself. Vladyka stressed that although he thanks everyone for their love, their greetings, prayers and expressions of joy from the heart, his soul was still filled with sorrow… He was sad that so many souls were drawn into schism, he grieved for the eminent and deeply-respected Metropolitan Vitaly, whom he loved and who had brought so much good to the Holy Church over his long life, but who was now surrounded by those with ill intent who are exploiting his elderly weakness, feeding him slander against the Sobor of Bishops. Vladyka Laurus further said that he grieved over the pastors and laypersons who left our Holy Church , and prayed the Lord to grant wisdom to them all. Finally, Metropolitan Laurus, with tears in his eyes, asked for all for their strengthening, holy prayers for himself and for his flock. In becoming the First Hierarch, Vladyka continues to bear his former obedience as the superior of Holy Trinity Monastery and Editor-in-Chief of the periodicals of Holy Trinity Monastery in the Russian language, to wit: Pravoslavnaya Rus' , Pravoslavnaya Zhizn' and Pravoslavniy Put' . Kind, devoted and loyal helpers to Vladyka always were and continue to be to this day His Grace Bishop Peter (Lukianov) of Cleveland, who for many years served as Vladyka Laurus' secretary, consecrated last year on the feast day of SS Peter and Paul; Protodeacon Victor Lochmatov, by Vladyka's side since 1957 and Reader Nicholas Olhovsky, Metropolitan Laurus' cell-attendant. From the 1990's, His Eminence Metropolitan Laurus visited Russia more than once to acquaint himself with church life in Russia and to visit holy places in the fatherland. Last autumn, His Eminence accepted with gratitude the invitation of His Holiness Patriarch Alexy II of Moscow and All Russia to visit the Russian Orthodox Church of the Moscow Patriarchate, given to him by President V.V. Putin. The first official visit to Russia of His Eminence occurred in May 2004. "A city that is set on a hill cannot be hid" (Matthew 5:14). It is impossible to hide an aromatic flower in a field of wild grass, for people will find it from the smell; and so the meek founders of Holy Trinity Monastery, Archimandrites Panteleimon and Joseph could not hide, for the aroma of their spiritual lives drifted widely, sensed by the hearts and souls of the Russian emigration as a whoe, and those who sough the true faith of Orthodoxy. Eternal memory to the builders, the brethren struggling here, the novices and trudniki, the donors, the teachers and students, and His Eminence Metropolitan Laurus, Abbot of the Monastery and the brethren! We sish them further success and the abundance of the mercies of God! May the Lord grant us all to love and value our Russian Orthodox monasticism, upon which depends the survival of our Holy Church . Only two decades after its establishment, the Russian Orthodox Church Outside of Russia began to feel the need for pastors who had a systematic theological education. Well-prepared priests, educated in the seminaries and academies of pre-Revolutionary Russia , were either retiring or passing to the better world, but those who replaced them were less well educated. This problem was addressed at the beginning of World War II with the offering of theological courses at the Monastery of St Job of Pochaev in the Carpathian Mountains and the Orthodox Theological Institute in Wroclav. But because the war dragged on, and due to the evacuation of the Synod of Bishops and its flock from the areas suddenly controlled by the Soviets, the challenge of preparing the pastors of the future became, for a time, impossible to address. Archbishop Vitaly (Maximenko) of blessed memory, after the American Metropoliate separated at the Cleveland Sobor of 1946, was very concerned about the reorganization of the parishes in North America that remained loyal to the Russian Orthodox Church Outside of Russia, and to provide clergymen for them. At the time, following the end of World War II, many refugees began to resettle in the New World, including the US . After the Cleveland Sobor, only a few parishes remained with the Church Abroad. But now immigrants began to appear who appealed to Archbishop Vitaly for blessing to open new parishes. There were priests among the Russian emigres arriving in America from Eastern Europe , whom Archbishop Vitaly appointed to the newly-established parishes. Vladyka Vitaly foresaw that the Russian Church Abroad would be faced with a shortage of clergymen to minister to the flock. For this reason he began to develop a plan to educate and train candidates to serve the Holy Church . Towards this end, Vladyka Vitaly took the following steps: at a meeting of the bishops who remained loyal to the Russian Orthodox Church Outside of Russia, during a meeting of the Diocesan Administration in New York on 15/28 June, 1948, the matter of creating a theological school was raised. At the suggestion of Archbishop Vitaly, a report by N.N. Alexandrov was heard on establishing Holy Trinity Seminary at the monastery in Jordanville. He reported on the application he made to the State of New York for permission to open a theological school. Draft rules and regulations for the seminary were also presented. The goal of the seminary was to give young people a spiritual education and good ecclesiastical training to prepare them to serve as priests. This education would include the following disciplines: theological subjects, philosophy, world and ecclesiastical history, languages, church singing, etc. The Trustees of the Seminary were Archbishop Vitaly, Archbishop Tikhon, Archbishop Ioassaf, Archbishop Ieronim, Hegumen Panteleimon, with Hegumen Iosif as the Secretary, and the monastery's "printer," Hieromonk Anthony (Yamshchikov, +1993), was the Treasurer. Its teachers were Archbishop Vitaly: Patristics and Homiletics; Bishop Seraphim (Ivanov): Dogmatic Theology and Liturgics; Protopriest V. Demidov: Apologetical Theology and Church History; Bishop Nikon (Rklitsky): Moral and Pastoral Theology; Hegumen Iosif: Church Music; Hieromonk Kyprian (Pyzhov): Church Art. Alexandrov's plan, in which he is named Dean of the Seminary, included other subjects and languages as well. "To appoint Dr NN Alexandrov (Professor of Rhode Island State College) as Vice President, with the task of legalizing and effect the opening of the Seminary. "To confirm the staff of teachers listed in the Seminary Regulations." Professor Alexanderov immediately began applying for permission from the State of New York to open the Seminary. On July 16, 1948, he received authorization from the State Board of Education to establish the Seminary, with the caveat that "the goal for which this corporation is established is to create a seminary to educate young people to serve as white and black clergymen for the Russian Orthodox Church in America ." Archbishop Vitaly sent a report to Metropolitan Anastassy in Munich , in which he briefly mentions the measures taken to open the Seminary, listing the officers of the corporation, the teachers and subjects scheduled for the first year. Metropolitan Anastassy replied via telegram: "The Synod of Bishops blessed the opening of the Seminary. Metropolitan Anastassy." Then an ukase was issued by the Synod of Bishops of September 22/October 12, 1948, stating: "Decreed: to confirm the establishment of Holy Trinity Seminary in Jordanville in accordance with the proposal presented, and to bless the commencement of the first semester beginning on October 1/14, 1948,"
So, with God's help, on the day of the Protection of the Most-Holy Mother of God in 1948, a moleben was served before the beginning of studies, and the following day, regular classes began. There were seven students enrolled the first semester, and nine the second. The year ended on the feast day of SS Cyril and Methodius in May, 1949. There were a total of 28 weeks of study and 15 hours of classes per week. Starting with the second semester of 1948-49, the Seminary Rector was Archbishop Vitaly, and Bishop Seraphim was relieved of his duties at the Seminary. ND Talberg acutely called the Seminary the child of Archbishop Vitaly. But Vladyka found it difficult to find time for his Rectorship and the operation of a large diocese, and being Abbot of Holy Trinity Monastery, so in 1951, he invited Archimandrite Averky (Taushev) from Munich , who, after a year of teaching in 1952, was confirmed by the Synod of Bishops as the Seminary Rector. In 1953, Archimandrite Averky was consecrated to the episcopacy, and, heading both the Diocese and Monastery from 1960 on, was also the Seminary Rector until his death in 1976. After his death, his protege, Bishop Laurus (Shkurla) of Manhattan , himself a graduate of the Seminary's class of 1954, became Rector. Over the course of many years, Vladyka Laurus taught Dogmatic Theology and Canonical Law at the Seminary. Becoming the First Hierarch of the Russian Orthodox Church Outside of Russia, His Eminence Metropolitan Laurus continues to this day to be the Seminary Rector. Through his efforts, Holy Trinity Seminary celebrated its 50 th anniversary in 1998, and has in recent years organized a series of scholarly conferences. It is important to remember the Seminary's deans, who worked towards preparing a whole generation of clergymen for the Russian diaspora—Professor Alexandrov, who established the curriculum and administration of the Seminary; EE Alferov, a magnificent historian and true expert of the life and work of Holy Royal Martyr Tsar Nicholas II; and EI Klar. The Seminary teachers also deserve credit: Archimandrite Konstantin (Zaitsev), Protopresbyter Michael Pomazansky, ND Talberg, IM Andreevsky and many others. Many earned praise for their educational work not only throughout the Russian diaspora, but became teachers of the Word of Bod for many Orthodox people in their historical Homeland , Russia . For over 50 years, the Seminary's more than 200 graduates received a Bachelor's Degree in Theology. Many became servants of the Church of Christ , from Metropolitan to layman. The words spoken to the seminarians by Archimandrite Averky more than 40 years ago serve a sort of testament: "Our common duty is to remember that Holy Trinity Seminary, is our only religious school; but also that to some degree, depending on it are the future of our Russian Orthodox Church Outside of Russia, our much-suffering Russian people scattered throughout the world, our Homeland itself, which will be in such need of true, well-prepared pastors, if God allows us to return; moreover, I make bold to say the following: the future of all mankind depends on it, since its fate, as we clearly see now, is in fact and mysteriously closely-bound, to the fate of our Homeland." Now a few words about the icon-painting shop established by Archimandrite Kyprian (Pyzhov), the famous icon-painter, who earned universal praise for his work. In the history of post-Revolutionary Russian art, Archimandrite Kyprian clearly takes the fore. If each important artist makes a statement, unrepeatable and beyond imitation, then this certainly applies to the work of Fr Kyprian. With astounding ease and unheard-of speed, Fr Kyprian painted church frescoes, portraits, reflected the poesy and beauty of nature in his landscapes and created Nativity and Paschal cards used by the entire Russian world. Kyrill Dimitrievich Pyzhov, tonsured Kyprian, was born in St Petersburg on January 7/20, 1904. Soon after, his father, Dimitri Mikhailovich Pyzhov, was appointed the zemsky (regional) Supervisor in Bezhetsk uezd of Tverskaya guberniya. There, in 1912, Kyrill's mother, Alexandra Konstantinovna, nee Strinskaya, died. She was an artist who graduated the Moscow School of Painting and Sculpture; she worked in the studios of Makovsky, Polenov, Perov and others. She inherited her talent from her father, who completed the Academy of Art in Florence . After the February Revolution, Dimitri Mikhailovich and his three sons, Evgenii, Kyrill and Georgii (later Hieromonk Gregorii), moved to Petrograd , where they were to endure hunger and cold. By the end of 1918, they left for Shchigri in the Kursk guberniya. Awaiting the arrival of the White Army, the Pyzhovs made their way to Simferopol . Here, 15-year-old Kyrill became a volunteer soldier and was sent to the front. From then on he endured the entire tribulation of the Volunteer Army—evacuation and Gallipoli. Here, Kyrill joined Alexandrov Military School , where he studied for three years until its dismantling in 1923. Kyrill left for France through Bulgaria to join his older brother. In Paris , Kyrill worked in a studio that made toy horses, then joined an atelier of designers in the Russian film studio "Albatross," where he participated in creating the film Don Quixote, with Feodor Chaliapine playing the lead role. Soon after Kyrill moved to Parish, his father and brother George joined him. The three of them then began working as painters. During the evenings, the brothers attended Montparnasse School of painting and drawing, where professors from the Ecole des Beaux Arts taught. Living in Parish, Kyrill began feeling ill. He was diagnosed with tuberculosis and was advised to move south. A French design firm sent Kyrill as an expert to its office on the Riviera . He soon regained his health and began decorating fashionable villas. "I thought of marriage," wrote Fr Kyprian in his memoirs, "but whenever an opportunity presented itself, an unseen hand would take me away." In Nice, Kyrill lived with his brother, Hieromonk Gregorii. Kyrill became an ardent parishioner of the local cathedral, where he befriended Priest Alexander Elchaninov. Under his influence, Kyrill immersed himself in the study of the Orthodox faith and he begins sensing a pull towards the Church and church services. He began to study the techniques of icon painting under Fr Alexander's matushka, a student of the artist Sofronov. In the summer of 1932, Hieromonk Savva (Struve) arrived in Nice to collect donations for Ladomirovo Monastery. Fr Savva showed photographs of the monastery, which awakened in Kyrill the desire to help distribute its publications. "The best way you could help the monastery would be to go there yourself and apply your abilities there," replied Fr Savva. "I said that would be difficult, since I did not have an international passport, but Fr Savva immediately offered to write an appeal to Archimandrite Vitaly to accept me as a novice, and to send me an invitation. Fr Savva added that I could paint frescoes in the new church, which I would like, and I replied that I would like to try my hand at it… So my fate was decided," recounted Fr Kyprian. In the winter of 1933, before the Nativity of Christ, approaching the town of Ladomirovo , Kyrill saw the church which would be the canvas of his talent: his first frescoed decoration of a church was completed in 1934. That autumn, Bishop Vitaly tonsured Novice Kyrill to the rassophore, "for painting our church." His tonsure to the mantle was performed in 1937, and in 1938, Monk Kyprian was ordained to the rank of hierodeacon. In 1940, Metropolitan Anastassy, arriving from Yugoslavia , ordained Fr Kyprian to the rank of hieromonk. War broke out. The monastery's brethren evacuated through Bratislava to Berlin , where they found shelter in a half-ruined house. Fr Kyprian, suffering from pneumonia, was sent to a convent dormitory across from a church, whose Rector was Archimandrite Ioann (Shahovskoy). When the recuperated Fr Kyprian entered the church a month later, and approached the candle desk, he noticed printed copies of icons he painted for a Dresden commission. Continuing the monks' exodus from Berlin to Geneva , he finally found the final destination of his wanderings—Holy Trinity Monastery in Jordanville. "My very first days in Holy Trinity Monastery," remembered Fr Kyprian, "reminded me of my first days at Ladomirovo Monasetery in Carpathian Russia ; but this feeling did not last. Soon an icon-painting studio was set up. Novice Nikolai, who was tonsured with the name of Alypy, in honor of the icon-painter of Pechersk, I obtained an irreplaceable helper, both in the studio and in obedience, who became an emulatorof the ancient monk of Kievo-Pecherskaya Lavra, Hieromonk Alypy. "In 1946, building commenced of the brick church dedicated to the Holy Trinity. In 1950, it was completed and consecrated by Metropolitan Anastassy. The painting of the interior of the church was also finished in time for the consecration. Following this, construction of the four-storey monastic residence began, which also contained the print shop, offices and refectory. "A small church dedicated to the Dormition of the Mother of God was built in the monastic cemetery according to the design of V. Glinin, and also decorated by the icon-painters. A few other churches in the USA [Entrance into the Temple Church in Syracuse, NY, St John of Kronstadt Memorial Church in Utica, NY, the Cathedral of the Mother of God "Joy of All Who Sorrow" in San Francisco, and others— ed . ]; and in Europe [Luxembourg], where in 1982, the newly-constructed Church of SS Peter and Paul was painted. "In 1988, the frescoes in St Vladimir Memorial Church in Jackson , NJ , built with the blessing of Archbishop Vitaly, were finished. We began to feel at home in Holy Trinity Monastery, and 'grew together' with its founders." Heading the icon-painting studio, Fr Kyprian managed to educate not only numerous iconographers, who painted icons in the canonical ecclesiastical style throughout the world, but, as the spiritual father of monks and seminarians, participated in the preparation of many future archpastors and pastors of the Russian Orthodox Church Outside of Russia. Fr Kyprian died in 2002, and is buried in the crypt under the altar of the Monastery Cathedral. Every day, except for Sundays and holidays, life in the Monastery begins before dawn, at 4:30 am, when the monks are awakened. They gather in the Cathedral, where midnight office is performed. The seminarians rise at 5:15 and prayer in the chapel located in the Seminary dormitory, then join the monks, praying at Divine Liturgy at the Cathedral. At 7:30, breakfast is served, after which the seminarians head for the main Seminary building for classes until lunch. At 4 pm, compline and matins begin, performed in turn by one of the hieromonks. Services continue until 6:30 pm. Dinner begins at 7 pm and immediately afterwards, small compline with evening prayers are performed, which end at 8:15. The remaining time is spent by the monks in prayer and reading, while the seminarians continue their studies. Since the moment of its founding, the full cycle of services has been performed at the Monastery, in accordance with the traditions and rules of the Church. On a typical weekday, services last some 6 hours in total. On the eve of Sundays and holidays, all-night vigil is performed according to current practice, and a solemn hierarchal Liturgyis performed on the Sunday or holiday itself, with the participation of monks and pilgrims. Services are held in Church Slavonic with traditional Russian chants sung by a choir consisting of monks and seminarians. Those attending these services, surrounded by frescoes and icons painted in the Byzantine style, the sound of solemn church singing, breathing in the aroma of incense and candles, feel as though they are in heaven. The monks of Holy Trinity Monastery have a great number of various tasks, or obediences. The main ones for both monks and seminarians include work in the print shop, the bookbinding shop, the book store, the kitchen, the bakery, the icon-painting studio and icon-mounting studio, cleaning the monastery premises and tending to its property. Archbishop Vitaly would say: "God helped us preserve the 300-year legacy of our father, Job: the church print shop, so that we could continue the task of providing the written word to all our Orthodox brethren throughout the world. With God's help, we must perform this work of mercy to our brothers, as our sole obedience before our Mother Church in the homeland." Heeding his archpastoral instructions, the monastic residence have printed and continue with all earnestness to print a significant quantity of service and educational literature, and also publish the following periodicals: Pravoslavnaya Rus' [Orthodox Russia], Pravoslavnaya Zhizn' [Orthodox Life], Pravoslavniy Put' [The Orthodox Way] and Orthodox Life in English. The print shop also publishes lithograph icons and the works of Fr Kyprian of blessed memory. During the summer, the monks and seminarians also work the gardens, work the fields, tend to the cemetery. They participate in the services: they chant and read on the kliros, serve in the altar. During the school year, the seminarians devote a significant time to their studies, and some of the monks are also teachers. Monks who are also priests perform services and tend to their flock. 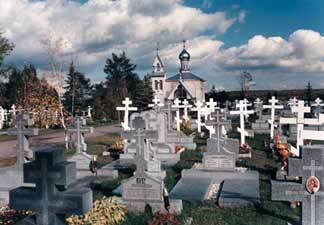 The place of repose of many Russian Orthodox Christians who lived and died abroad is the Monastery cemetery, established in 1936 near the Monastery itself. The main adornment of this plot of Holy Russia is Dormition Church , built among the many gravesites adorned with Orthodox crosses and ever-burning lampadas. At the present time, a second cemetery is being built. It is a great consolation for many Orthodox Christians that their beloved friends and relatives are under the prayerful vigil of the Monastery, in such a lyrical and blessed location. The cemeteries are visited not only by relatives of the deceased, but by monks and seminarians. The monastery takes its obligation of praying for the dead very seriously, and the names of the Orthodox Christians buried in their cemetery are read at every Divine Liturgy. Several times a year, a common pannikhida is performed for all, after which the pilgrims take with them a sense of peace and consolation. This outline was prepared with the help of materials published by Holy Trinity Monastery. 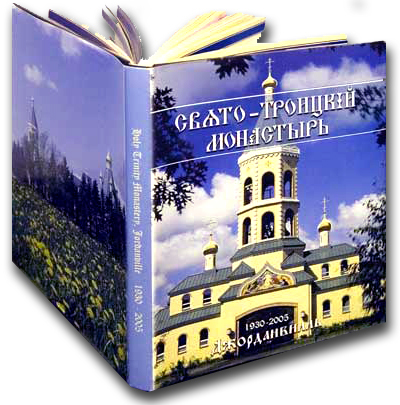 A new album on the 75 th anniversary of Holy Trinity Monastery is now available. It includes many photographs from its life and history. For further information, contact Protodeacon Victor Lochmatov at (315) 858-0940 or Protopriest Andrei Sommer at the Synodal Bookstore at (212) 534-1601.